- At the press conference of Konyaspor, we talked a lot about the international experience of Shakhtar. In this Europa League season, the Pitmen have already met with the Turkish team. Is it possible to compare Istanbul Basaksehir with Konyaspor and will the previous games be helpful to you? - Hello. Yes, we have recently had the opportunity to play with the club from Turkey. But I think those matches will be completely different. Tomorrow, we will face different opponents, with different characteristics, the match will take place on a different field, we are facing quite different challenges. So, I think comparing the two upcoming meetings is completely not worth it. We have studied the opponents well enough. They are a strong team with an organised defence. We know that Konyaspor last season ranked third in such a strong league as Turkish one. And we perfectly understand that they have not lost a single game in the new season so far. We are facing a tough meeting. Besides, the opponents are playing their debut match in European competitions, so the motivation will be sky-high. - In recent days, Ismaily trained individually. What is his injury and is he ready to take the field tomorrow? - Yes, Ismaily was really injured. After our game against Dynamo, he did not train with the team for a few days. However, he exercised with the main group at yesterday's session. And today, Ismaily is one hundred percent ready for the upcoming meeting. 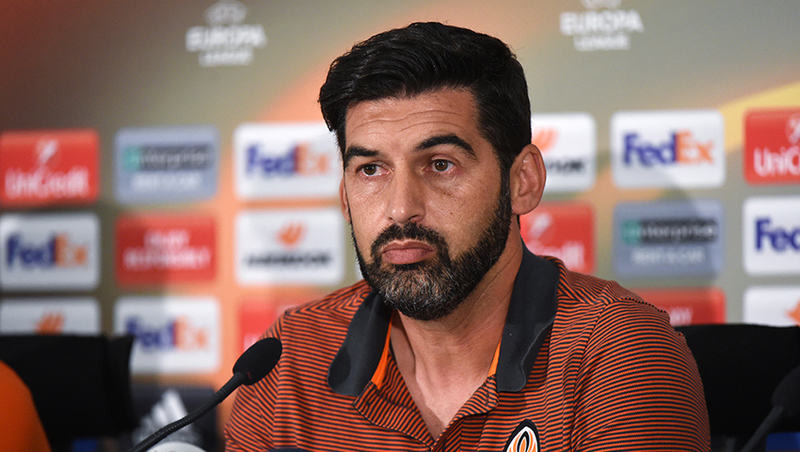 - We knew the fact that Darijo Srna would not play a week ago. But the information that Konyaspor’s attacking spearhead Dimitar Rangelov would not take part in the game, appeared just yesterday. Is it a serious loss for the opponents? - I cannot comment too much on the opponents and the player who will miss the match. Konyaspor coach must think about that and take some decisions, make substitutions – that’s their business. As for Srna, that’s really a loss for us, because Darijo is one of the important elements of our team. Nevertheless, Bohdan Butko, who also perfectly performs his duties, will take his place tomorrow. But once again, Darijo is very important for our team. - What’s the reason behind the absence of Yevhen Seleznov on the player list? Is it due to his physical condition or is it a tactical idea? - I do not know if you know it, but Seleznov was on the list for this match. This morning, he arrived at the airport, but suddenly picked up a respiratory tract infection. So he was just unable to come with us. - The question is kind of a laughing matter. Before the meeting between Ukraine and Iceland, the press conference was attended by Oleksandr Kucher, with him appearing with the captain's armband on the following day. Today, he is here again, in the company of the head coach. Does this mean that in the absence of Darijo Srna, Kucher will appear as the captain tomorrow? - Yes. Oleksandr is one of the captains of our team, and tomorrow he will take the pitch with the armband on. - At the airport, the representatives of Konyaspor welcomed you. Have you ever enjoyed the same kind of reception in your career? - I can talk for ages about the way they received us. It was very nice, it was a really warm welcome. I’ve never experienced anything similar. That’s even a kind of unusual for a team to receive their opponents. Another oddity is this: I'm a man and they brought flowers into my room. That’s also quite unusual for me. - You said that Bohdan Butko would appear from the off, who previously came on just as a substitute. Are you sure that he will be able to fully replace Darijo Srna? - I fully trust Bohdan, like any other football player of my team. Butko is a young guy, but a great professional. He performed pretty well in the match for the national team of Ukraine, also playing well against Dynamo. Therefore, I have absolute trust in him. - Has Taison recovered after the trip to Brazil? - All the players who have arrived here today are fully prepared to play tomorrow for the team. Including Taison.